Dr. Sanjeev Choudhary is best Interventional Cardiologist with an experience of over 10 years. Dr. Choudhary has contributed maximum number of cases all over India in multinational TAO study. Dr. Sanjeev Choudhary has a special interest in primary angioplasty (angioplasty in acute heart attack) and coronary artery disease in diabetics. 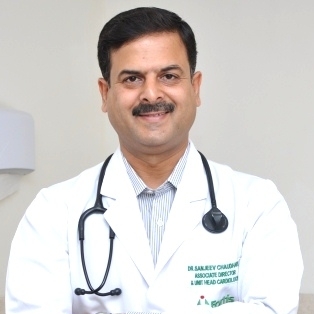 Dr. Sanjeev Choudhary is one of the top Cardiologists in Gurgaon and has an experience of over a decade in this field. He has a vast experience in performing coronary angioplasty and has performed over 5000 interventional procedures. Dr. Sanjeev Choudhary has a keen interest in clinical research and is principal investigator in many clinical research studies. Dr. Sanjeev Choudhary was last associated with Paras hospitals Gurgaon as senior interventional cardiologist, and now is the Director, Interventional Cardiology at Fortis Hospitals, Gurgaon.